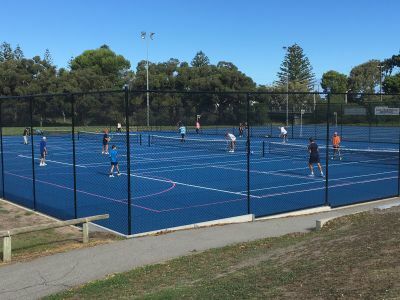 The popular seaside town of Victor Harbor has a big, new, bright patch of blue – eight freshly resurfaced and upgraded tennis courts! 14 years after being laid, the courts – which also double as netball courts – had been looking a bit tired. Fencing at the George Main Road courts complex was also a bit sad. At a cost of $204,000*, those problems are now a thing of the past: the reborn courts (and their fences) are safer, and more tennis and netball players and teams are using them - as are members of the general public, and Victor Harbor High School’s 800 students. Best of all, the local netball team can now legally host finals – a big fillip for its finances! In the town’s humble opinion, the revamped complex now has the finest multi-use courts outside Adelaide (another reason to visit VH! ).